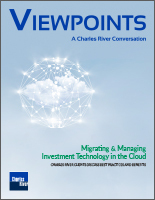 Charles River delivers its investment management solution via a private-cloud Software as a Service (SaaS) deployment model, supported by a global team of application specialists. This approach improves the end user experience by providing timelier software upgrades, ongoing functional enhancements, and improved data integration, management, and support. Charles River also facilitates use of standard interfaces and works directly with interface counterparties to simplify integration. Our global “follow-the-sun” support team assures round-the-clock support and expertise so problems are resolved more efficiently. Software as a Service (SaaS) deployment simplifies client operations, improves data quality and investment professional productivity, manages risk, and lowers technology costs. 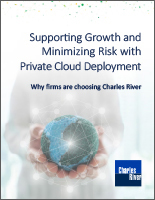 Private Cloud-based Delivery – Charles River keeps the software current by managing regular upgrades and ensuring optimal application performance and reliability. Application specialists manage the Charles River IMS according to best practices, and provide application and integration expertise that is difficult for firms to build and maintain in-house. Integrated Data Services – Charles River alleviates many of the challenges, complexities, and cost of data management by integrating multiple data sources to provide more complete, accurate and timely data to the Charles River IMS. Compliance Services – Charles River offers several services that help extend the client’s compliance organization. Charles River’s Compliance Rule Advisory Services help ensure that workflows are efficient and rules align with client mandates and regulatory requirements. Compliance as a Service (CaaS) provides Charles River’s Compliance monitoring capabilities as an easy-to-deploy, standalone hosted offering, supported by advisory services. Global Shareholder Disclosure Services help subscribers comply with shareholder disclosure regulations across 85 jurisdictions. FIX Connectivity – Charles River’s certified global FIX network is administered by an experienced global FIX team that manages, tests and certifies broker connectivity, ensuring seamless, reliable electronic trading. To help ensure high end-user satisfaction and value for clients, Charles River offers a comprehensive set of support services designed to meet each firm’s unique needs based on geography, available resources, budget, and overall goals. Our approach is pragmatic and flexible, encompassing training, end-user support, onsite support, product knowledge and proven methodologies for successful deployment. All Charles River products, services and business operations worldwide are certified to meet ISO 27001 security standards.